Unplug HVPS from the computer. Launch the file dpinst-amd64.exe (64 bits) or dpinst-x86.exe (32 bits) and accept the installation of drivers. Connect the HVPS to the USB port of your computer. If the drivers have been correctly installed, a COM port should appear in your device manager. No driver are needed, but the first time you plug a HVPS, a Keyboard Setup Assistant dialog box will be displayed. You should simply close it using the red button at the top left of the window. If you want to assemble, test and calibrate a new HVPS, you will need to download and install the Arduino IDE. The installation includes the required drivers. Download and install the version corresponding to your system. Accept the proposition of the installer to also install the required drivers. 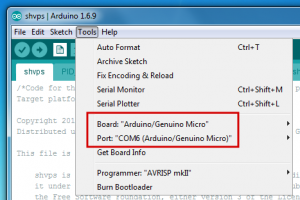 In the Tools menu, you must select Arduino/Genuino Micro as target platform. You must also choose the correct COM port to which your board is connected. If you have connected an Arduino Micro to your computer, but none are showing in the list, then the drivers are not correctly installed. Refer to the documentation on the Arduino website, or the instructions given above to install the drivers. Refer to the Arduino documentation on the arduino website for more information on how to program the microcontroller. Basically, once you have installed the drivers, and selected the correct board and port as described on the image, you can simply open a sketch and press on the “upload” button to compile the sketch and send it to the Arduino. If you do that on a micro-controller which is installed on the SHVPS board, be sure that the High Voltage enable switch (S2) is on the 0 (off) position!